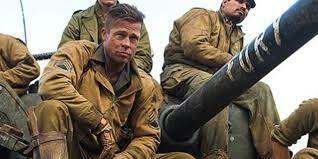 “Fury,” David Ayer’s much-anticipated World War 2 epic, earns its stripes the old-fashioned way ‒ with mud and guts. This grim chronicle of the final days of the European campaign is told through the sunken, battle-weary eyes of a single Sherman tank crew, led by a brooding, at-times-kill-happy sergeant who prides himself on watching over his four-man crew like a khaki-clad mother hen. Sgt. Don “Wardaddy” Collier, played with steely resolve by a stoical, scar-laced Brad Pitt, has seen his men through one engagement after another, from North Africa to Normandy … and now into Germany for the final push … and what will be some of the bloodiest fighting of the war. Their backs against the wall, Hitler and the S.S. have turned women and children into tank fodder. We sense from the first frame of this war saga that things will come to a bad end for what’s left of the tank battalion because they have just lost their assistant driver (his face is plastered like a rubber mask on the inside of the tank). If this isn’t a strong enough hint, the rider-less white ‒ the hoariest of all war movie symbols ‒ should do the trick. Action-packed in the best sense but a tad too formulaic for my taste, “Fury” quickly introduces us to both the dead guy’s replacement, a sniveling private named Norman (natch), and the hard types conscripted from such war classics as “The Story of G.I. Joe” and “A Walk in the Sun.” Shia LaBeouf is the Scriptures-quoting gunner; the superb (as always) Michael Peña is the salty Hispanic driver; Jon Bernthal (“The Walking Dead”) is the wigged-out Neanderthal who loads the shells. Logan Lerman (“Noah”) plays Norman, who has been reassigned from the typing pool. He soon becomes the teacher’s pet. His evolution, from bookish humanist to battle-hardened killer nicknamed “Machine,” represents the dramatic backbone of this movie. Ayer, known for his in-your-face verisimilitude (see “End of Watch”), this time rubs our noses in the aftermath of battle. We glimpse German corpses being bulldozed; basins of blood being tossed at a field hospital; heads and legs being blown off. And just so you don’t miss the point that war is hell, Ayer lingers on a pancake-flattened German soldier, now one with the Allied road to victory. But, hey, let’s not be too nitpick-y. After all this is the year of the moribund “Monuments Men.” By comparison, “Fury” is gutsy and assured, as tough as discarded hardtack. And even if it isn’t as good as we had hoped ‒ it’s definitely not up there with “Saving Private Ryan” and “The Thin Red Line” ‒ it trundles forward with the assurance of Patton’s Third Army. More, it shows off Pitt in his juiciest character role to date. His Collier may pour on the clichés (“Good shooting, kid ‒ keep stacking ‘em up”), but as played by the onetime pretty boy he’s someone we’d gladly mount up with against impossible odds. And that’s saying something these days. Much of this movie seems to have completely gone over your head. gr8 flick, maybe your just a moran!